This beautiful early 20th century Impressionist oil painting is by well exhibited Scottish artist Mary Elizabeth Hamilton. 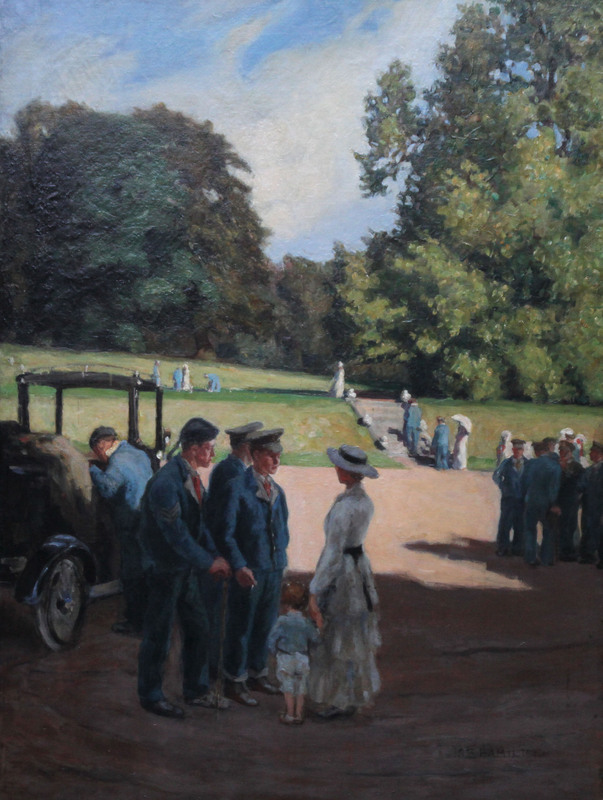 Painted circa 1918 we believe the scene is a visit to a country house near Edinburgh, used for convalescence in WW1. The recovering men can be seen in their 'hospital blues' and with their walking sticks as they talk to their visitors and walk in the grounds. The group in the foreground includes a woman in her finery and a little boy looking at his father. They stand in the shade whilst in the midground a lady shelters under a parasol from the bright sunshine and Hamilton has captured the heat of a summers day. The huge trees provide shelter and privacy from the outside world as the injured men try to recover. Signed lower right.